Great Danes are gentle, loyal, affectionate and very patient – above all they are very big! As long as you have the room, the time and the budget, Great Danes make excellent family pets – loving children and other animals. They are extremely popular family pets and watchdogs. Unlike other excellent watchdog breeds, Great Danes tend to bond with whole family, rather than developing a possessive streak aimed at one person. Great Danes are intelligent, spirited and courageous, always friendly – never timid or aggressive. Originally developed in Germany, the Great Dane (or Deutsche Dogge), this is a very old breed which has been a distinct type for over 400 years. The German nobility wanted an 'outstanding' dog to protect their vast country estates and hunt for the very savage and swift, wild boar. In 1880 the Germans outlawed the name Great Dane, in favour of Deutshe Dogges, but English speaking people have always ignored this! 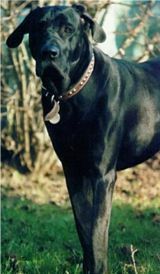 Due to the job they had to do, the original Great Danes were an aggressive and bad tempered lot, it is the Americans who have been credited with developing the lovable, dependable and even tempered breed we have today. 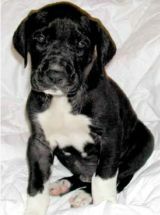 Our 4 Paw Rating - to the suitability of Great Danes for your home and lifestyle. A real home bird who loves his creature comforts, Great Danes will need somewhere soft to lie down – you will probably find them curled up on your favourite chair! Great Danes live in the house, not outdoors – as he will get lonely and pine and can also be sensitive to extreme temperatures. Make good protectors and hardly bark at all. Great Danes will be wary with strangers, but will welcome anyone that you do. Great Danes need a lot of free running when fully grown, although care must taken not to over-exercise until fully developed. Great Danes are quick to learn and eager to please. Early leash training is recommended to teach them not to pull, as given their adult size, this can cause problems.